First of all, in the context of science, you should never speak of evolution as a "theory." There is no theory about whether or not evolution happens. It is a fact. Scientists have, however, developed tested theories about how evolution happens. Although several proposed and tested processes or mechanisms exist, the most prominent and most studied, talked about, and debated, is Charles Darwin's idea that the choices of nature guide these changes. The fame and importance of his idea, natural selection, has eclipsed the very real existence of other ways that populations can change over time. Evolution in the biological sense does not occur in individuals, and the kind of evolution we're talking about here isn't about life’s origins. Evolution must happen at least at the population level. In other words, it takes place in a group of existing organisms, members of the same species, often in a defined geographical area. We never speak of individuals evolving in the biological sense. The population, a group of individuals of the same species, is the smallest unit of life that evolves. To get to the bottom of what happens when a population changes over time, we must examine what's happening to the gene combinations of the individuals in that population. The most precise way to talk about evolution in the biological sense is to define it as "a change in the allele frequency of a population over time." A gene, which contains the code for a protein, can occur in different forms, or alleles. These different versions can mean that the trait associated with that protein can differ among individuals. Thanks to mutations, a gene for a trait can exist in a population in these different forms. It’s like having slightly different recipes for making the same cake, each producing a different version of the cake, except in this case, the “cake” is a protein. 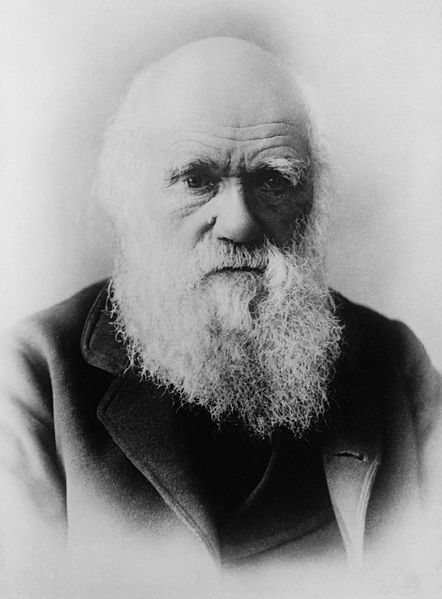 Charles Darwin, who didn't know anything about alleles or even genes (so now you know more than he did on that score), understood from his work and observations that nature makes certain choices, and that often, what nature chooses in specific individuals turns up again in the individuals' offspring. He realized that these characteristics that nature was choosing must pass to some offspring. This notion of heredity--that a feature encoded in the genes can be transmitted to your children--is inherent now in the theory of natural selection and a natural one for most people to accept. In science, an observable or measurable feature or characteristic is called a phenotype, and the genes that are the code for it are called its genotype. The color of my eyes (brown) is a phenotype, and the alleles of the eye color genes I have are the genotype. What is nature selecting any individual in a population to do? In the theory of natural selection, nature chooses individuals that fit best into the current environment to pass along their "good-fit" genes, either through reproduction or indirectly through supporting the reproducer. Nature chooses organisms to survive and pass along those good-fit genes, so they have greater fitness. Fitness is an evolutionary concept related to an organism's reproductive success, either directly (as a parent) or indirectly (say, as an aunt or cousin). It is measured technically based on the proportion of an individual's alleles that are represented in the next generation. When we talk about "fitness" and "the fittest," remember that fittest does not mean strong. It relates more to a literal fit, like a square peg in a square hole, or a red dot against a red background. It doesn't matter if the peg or dot is strong, just whether or not it fits its environment. One final consideration before we move onto a synthesis of these ideas about differences, heredity, and reproduction: What would happen if the population were uniformly the same genetically for a trait? Well, when the environment changed, nature would have no choice to make. Without a choice, natural selection cannot happen--there is nothing to select. And the choice has to exist already; it does not typically happen in response to a need that the environment dictates. Usually, the ultimate origin for genetic variation--which underlies this choice--is mutation, or a change in a DNA coding sequence, the instructions for building a protein. Don't make the mistake of saying that an organism adapts by mutating in response to the environment. The mutations (the variation) must already be present for nature to make a choice based on the existing environment. When Darwin presented his ideas about nature's choices in an environmental context, he did so in a book with a very long title that begins, On the Origin of Species by Means of Natural Selection. Darwin knew his audience and laid out his argument clearly and well, with one stumbling block: How did all that heredity stuff actually work? We now know--thanks to a meticulous scientist named Gregor Mendel (who also was a monk), our understanding of reproductive cell division, and modern genetics--exactly how it all works. Our traits--whether winners or losers in the fitness Olympics--have genes that determine them. These genes exist in us in pairs, and these pairs separate during division of our reproductive cells so that our offspring receive one member or the other of the pair. When this gene meets its coding partner from the other parent’s cell at fertilization, a new gene pair arises. This pairing may produce a similar outcome to one of the parents or be a novel combination that yields some new version of a trait. But this separating and pairing is how nature keeps things mixed up, setting up choices for selection. 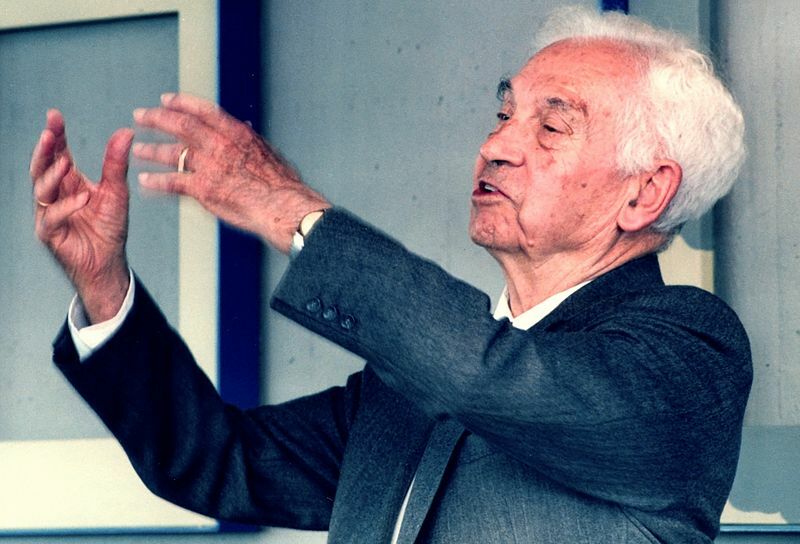 With a growing understanding in the twentieth century of genetics and its role in evolution by means of natural selection, a great evolutionary biologist named Ernst Mayr (1904--2005) guided a meshing of genetics and evolution (along with other brilliant scientists including Theodosius Dobzhansky, George Simpson, and R.A. Fisher) into what is called The Modern Synthesis. This work encapsulates (dare I say, "synthesizes?") concisely and beautifully the tenets of natural selection in the context of basic genetic inheritance. As part of his work, Mayr distilled Darwin’s ideas into a series of facts and inferences. Mayr’s distillation consists of five facts and three inferences, or conclusions, to draw from those facts. The first fact is that populations have the potential to increase exponentially. A quick look at any graph of human population growth illustrates that we, as a species, appear to be recognizing that potential. For a less successful example, consider the sea turtle. You may have seen the videos of the little turtle hatchlings valiantly flippering their way across the sand to the sea, cheered on by the conservation-minded humans who tended their nests. What the cameras usually don't show is that the vast majority of these turtle offspring will not live to reproduce. The potential for exponential growth is there, based on number of offspring produced, but…it doesn't happen. The second fact is that not all offspring reproduce, and many populations are stable in size. See "sea turtles," above. The third fact is that resources are limited. And that leads us to our first conclusion, or inference: there is a struggle among organisms for nutrition, water, habitat, mates, parental attention…the various necessities of survival, depending on the species. The large number of offspring, most of which ultimately don't survive to reproduce, must compete, or struggle, for the limited resources. Fact four is that individuals differ from one another. Look around. Even bacteria of the same strain have their differences, with some more able than others to with stand an antibiotic onslaught. Look at a crowd of people. They're all different in hundreds of ways. Fact five is that much about us that is different lies in our genes--it is inheritable. Heredity undeniably exists and underlies a lot of our variation. First, there is that struggle for survival, thanks to so many offspring and limited resources. See "sea turtle," again. Second, different traits will be passed on differentially. Put another way: Winner traits are more likely to be passed on. And that takes us to our final conclusion: if enough of these "winner" traits are passed to enough individuals in a population, they will accumulate in that population and change its makeup. In other words, the population will change over time. It will be adapted to its environment. It will evolve. public domain image, via Wikimedia. When Darwin presented his idea of natural selection, he knew he had an audience to win over. He pointed out that people select features of organisms all the time and breed them to have those features. 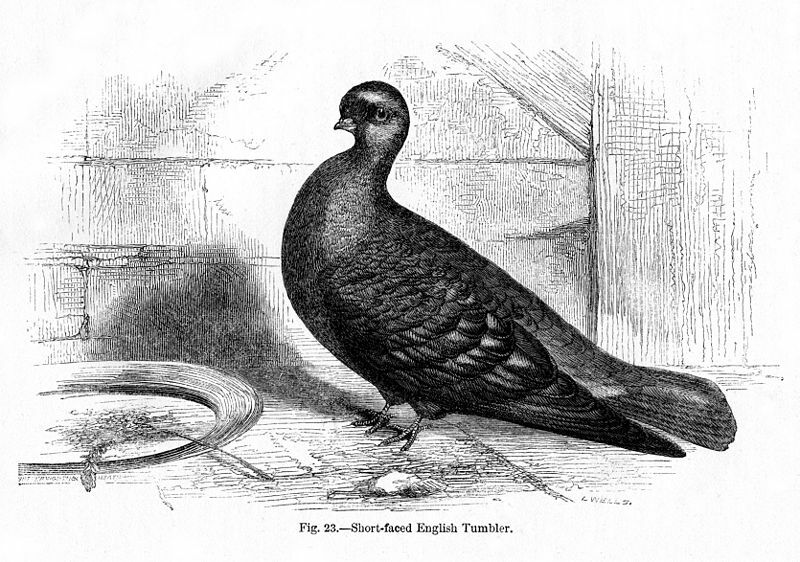 Darwin himself was fond of breeding pigeons with a great deal of pigeony variety. He noted that unless the pigeons already possessed traits for us to choose, we not would have that choice to make. But we do have choices. We make super-woolly sheep, dachshunds, and heirloom tomatoes simply by selecting from the variation nature provides and breeding those organisms to make more with those traits. We change the population over time. Darwin called this process of human-directed evolution artificial selection. It made great sense for Darwin because it helped his reader get on board. If people could make these kinds of choices and wreak these kinds of changes, why not nature? In the process, Darwin also described this second way evolution can happen: human-directed evolution. We're awash in it today, from our accidental development of antibiotic-resistant bacteria to wheat that resists devastating rust. What about traits that have no effect either way, that are just there? One possible example in us might be attached earlobes. Good? Bad? Ugly? Well…they don't appear to have much to do with whether or not we reproduce. They're just there. When a trait leaves nature so apparently disinterested, the alleles underlying it don't experience selection. Instead, they drift in one direction or another, to extinction or 100 percent frequency. When an allele drifts to disappearance, we say that it is lost from the population. When it drifts to 100 percent presence, we say that it has become fixed. This process of evolution by genetic drift reduces variation in a population. Eventually, everyone will have it, or no one will. Another way for a population to change over time is for it to experience a new infusion of genes or to lose a lot of them. This process of gene flow into or out of the population occurs because of migration in or out. Either of these events can change the allele frequency in a population, and that means that gene flow is another was that evolution can happen. If gene flow happens between two different species, as can occur more with plants, then not only has the population changed significantly, but the new hybrid that results could be a whole new species. How do you think we get those tangelos? One interesting mechanism of evolution is horizontal gene transfer. When we think of passing along genes, we usually envision a vertical transfer through generations, from parent to offspring. But what if you could just walk up to a person and hand over some of your genes to them, genes that they incorporate into their own genome in each of their cells? Of course, we don't really do that--at least, not much, not yet--but microbes do this kind of thing all the time. Viruses that hijack a cell's genome to reproduce can accidentally leave behind a bit of gene and voila! It's a gene change. Bacteria can reach out to other living bacteria and transfer genetic material to them, possibly altering the traits of the population. Sometimes, events happen at a large scale that have huge and rapid effects on the overall makeup of a population. These big changes mark some of the turning points in the evolutionary history of many species. has left them with little genetic variation. The word bottleneck pretty much says it all. Something happens over time to reduce the population so much that only a relatively few individuals survive. A bottleneck of this sort reduces the variability of a population. 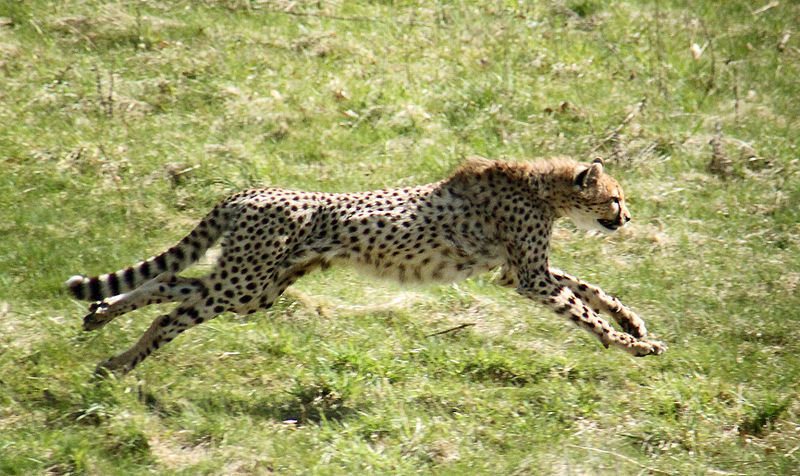 These events can be natural--such as those resulting from natural disasters--or they can be human induced, such as species bottlenecks we've induced through overhunting or habitat reduction. Sometimes, the genes flow out of a population. This flow occurs when individuals leave and migrate elsewhere. They take their genes with them (obviously), and the populations they found will initially carry only those genes. Whatever they had with them genetically when they founded the population can affect that population. If there’s a gene that gives everyone a deadly reaction to barbiturates, that population will have a higher-than-usual frequency of people with that response, thanks to this founder effect. Gene flow leads to two key points to make about evolution: First, a population carries only the genes it inherits and generally acquires new versions through mutation or gene flow. Second, that gene for lethal susceptibility to a drug would be meaningless in a natural selection context as long as the environment didn't include exposure to that drug. The take-home message is this: What's OK for one environment may or may not be fit for another environment. The nature of Nature is change, and Nature offers no guarantees. With all of these possible mechanisms for evolution under their belts, scientists needed a way to measure whether or not the frequency of specific alleles was changing over time in a given population or staying in equilibrium. Not an easy job. They found--“they" being G. H. Hardy and Wilhelm Weinberg--that the best way to measure this was to predict what the outcome would be if there were no change in allele frequencies. In other words, to predict that from generation to generation, allele frequencies would simply stay in equilibrium. If measurements over time yielded changing frequencies, then the implication would be that evolution has happened. In other words, a population that is not evolving is experiencing a complete absence of evolutionary processes. If any one of these is absent from a given population, then evolution is occurring and allele frequencies from generation to generation won’t be in equilibrium. One of the best examples of the influences of environmental pressures is what happens in similar environments a world apart. Before the modern-day groupings of mammals arose, the continent of Australia separated from the rest of the world's land masses, taking the proto-mammals that lived there with it. Over the ensuing millennia, these proto-mammals in Australia evolved into the native species we see today on that continent, all marsupials or monotremes. 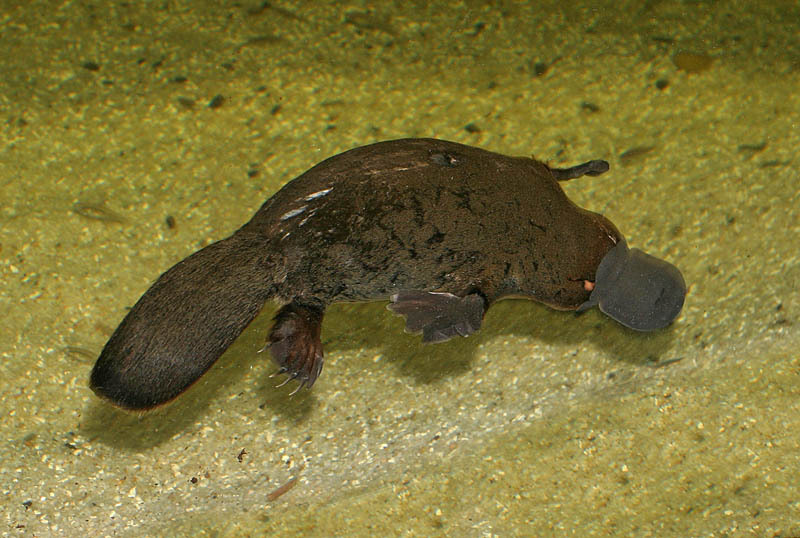 Among mammals, there's a division among those that lay eggs (monotremes), those that do most gestating in a pouch rather than a uterus (marsupials), and eutherians, which use a uterus for gestation (placental mammals). Elsewhere in the world, most mammals developed from a common eutherian ancestor and, where marsupials still persisted, probably outcompeted them. In spite of this lengthy separation and different ancestry, however, for many of the examples of placental mammals, Australia has a similar marsupial match. There's the marsupial rodent that is like the rat. The marsupial wolf that is like the placental wolf. There's even a marsupial anteater to match the placental one. How did that happen an ocean apart with no gene flow? The answer is natural selection. The environment that made an organism with anteater characteristics best fit in South America was similar to the environment that made those characteristics a good fit in Australia. Ditto the rats, ditto the wolf. When similar environments result in unrelated organisms having similar characteristics, we call that process convergent evolution. It’s natural selection in relatively unrelated species in parallel. In both regions, nature uses the same set of environmental features to mold organisms into the best fit. Note: This explanation of evolution and how it happens is not intended to be comprehensive or detailed or to include all possible mechanisms of evolution. It is simply an overview. In addition, it does not address epigenetics, which will be the subject of a different explainer.